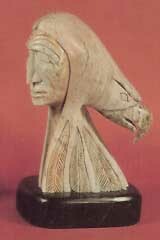 David Greene, Mohawk, is a soapstone sculptor. His pipes, depicting the sacred animals of his tribe, are in the Iroquois Indian Musuem, Howes Cave NY. All of David’s work reflects his tribal traditions, but speaks of their application today, in today’s world.